Welcome to another crazy NFL Sunday. Fantasy owners always have to expect the unexpected. Last week, there were definitely some standout performances fantasy owners should look out for, but also some losers that frankly, should make some owners consider what to do with them. Fantasy owners are still waiting to hear about the NFL’s punishment on Zeke’s suspension. But Zeke continues to tear it up each Sunday putting up unbelievable numbers. Sophomore Drew Garcia said, “He will be a great player for years to come and people should hold onto him.” On Sunday he matched his personal best for PPR fantasy points. He keeps dominating the field and as long as he keeps playing, the fantasy owners who have him are likely to make the playoffs. After a great debut, many fantasy owners thought he would do amazing against the Rams, but nope. Fantasy owners started him in about 80% of ESPN leagues. Peterson ended up getting 4.3 PPR fantasy points, the fifth-worst score in any of his 118 career games in which he had double-digit rushing attempts. Emmanuel Sanders was absent and yet Thomas still felt short of expectations again. Thomas put up only 3 PPR fantasy points, the ninth least of his 107 starts. Freshman Jack Rosenfeld said, “He could have done better. At this point, I would try to sell low.” Also Trevor Siemian did have a good game wither. His passes were too wild. So Sanders shouldn’t be blamed completely. Prescott has been consistent all year, and Week 7 was no short of that. He played his 21st career game in Week 5 and put himself in the top 10 in terms of fantasy points through that many games. Senior Grant Faucett said, “I love Dak. 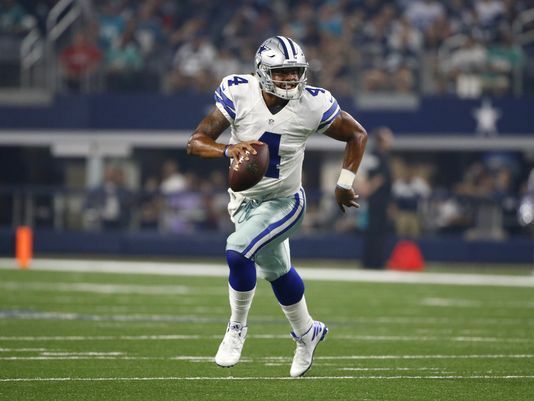 He can get you that 20 you need every game.” On Sunday, Dak didn’t even leave complete the game, he was taken out midway through the fourth quarter. But he will face a challenging matchup in Week 8 against the Redskins.